Here are Blocks 3, 4 & 5 of Jenny's Shabby BOM (The link is on my side bar) - I am really enjoying this project and it looks as though Jenny has many more gorgeous blocks to release - Next release is the 1st July. Winter time usually sees me cooking comfort foods for dinner - At least once a week I put a casserole in the slow cooker before I go to work and come home to a ready cooked meal - But other nights I have to make a little more effort :) This is last nights creation. I usually call these Chicken Wellingtons. I use cheese and bacon as a filling but there was no bacon to be found at our house last night so these ones were filled with home made tomato chutney and cheese. 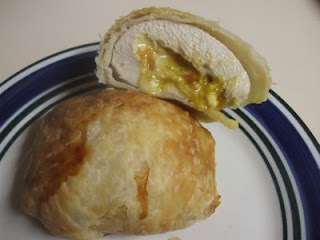 They are so easy to make - I use 1/2 chicken breast, chutney & cheese and a piece of pastry - Lay the pastry out, put the chicken breast down, smear with chutney and sprinkle with cheese - Wrap into a little parcel and pierce the top. Bake for around 40 minutes at 180 degrees celcius. They are delicious. This is tonight's dinner which was a Quiche (On the left) and an Egg & Bacon Pie. 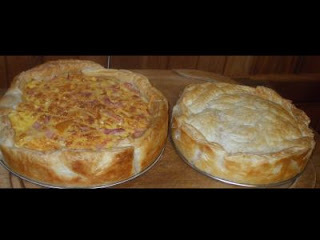 Hubby loves Quiche and the kids love Egg & Bacon Pie so I had to cook both. The upside is that Quiche will be for lunch tomorrow at work. I have lots of projects on the go at the moment as we all usually do - I did a bit of work on this one today it is Nanny Sharon's Picnic Quilt from Threadbare Creations. I am using Nature's Chorus from April Cornell which is going to look great with a cream homepsun, Moda's Howard Marcus Collection for a cause Roses and Moda Mottled Pink. I have sewn together 10 blocks and have another 10 to go for the body of the quilt. The pattern is available in my store if anyone would like to make one - Rose writes an extremely easy to follow pattern and makes everything look and sound easy. Today was my day off from my day job but boy we managed to get a lot done. Did I tell you that I bought myself an old ute? Maybe not......... Well I bought a litle Red Toyota Hilux Ute named "Terry". Terry's role will be to help me gather items for my garden and animals - well back to today ...... Terry and I (and hubby) took a little trip to collect Hay for the animals and to go to the nursery for fruit trees to add to our orchard. We bought Plum and Nectarine Trees ( a few different varieties) and also some strawberry runners and some gooseberry plants (I have been trying to buy some of these for ages and ages) The rest of the day was spent planting all of our new purchases and trying to tidy the veggie patch a little. A hot spa was in order for the end of the day but I must admit I am still a little sore. Bye for now from my little part of the world. Sounds like a very productive day Fiona, I have done two of Nanna's Quilts I just really love Rose's pattrns and have quite a few of then now I have allmost finished Familey Values done all the blocks put on all the squares now just have to put the lot togeather. Blocks are adorable and the food very yummy. Yum, how can I be hungry for your Cheesy Chicken at 10am? Lol. What a busy little life you lead. Hope everything is going well for you. 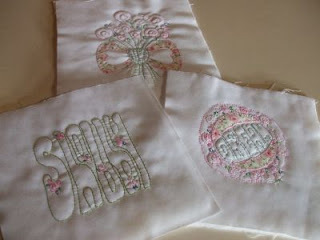 Beautiful stitching of course and those quilt block are going to be beautiful. Enjoy Terry - utes are very handy vehicles. You always make me feel lazy Fiona. Your blocks are wonderful and I have really enjoyed reading your posts today. 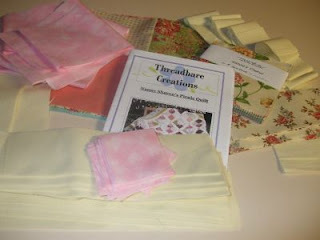 I have become a follower and hope to be participating in your Advent Swap...what a great idea! Your cooking makes me SO hungry!! They look delicious! Nana Sharons in Natures Chorus, sounds very pretty! Not sure what fabrics I will make mine in - cant believe Isabella has made 2!! I hope you will share some of your orchard once it is flourishing.